The Government of Canada introduced a new entry requirement in March 2016, known as an Electronic Travel Authorisation (eTA). This new eTA is now a requirement for all citizens of visa-exempt countries that are traveling to Canada by air. An eTA is electronically linked to a traveler’s passport. It is valid for up to five years or until the passport expires, whichever comes first. With a valid eTA, you can travel to Canada as often as you want for short stays (up to six months at a time). The information entered will be sent electronically to the Canada Department of Immigration and we will send your Canada eTA online via email in as little as 15 minutes. You will need to bring the passport you used to apply for your eTA, as the eTA is electronically linked to it. If you get a new passport, you need to get a new eTA. With a valid eTA, you can travel to Canada as often as you want for short stays (up to six months at a time). It is valid for up to five years or until the passport expires, whichever comes first. You must have a travel document/passport valid for at least 6 months from the date of your arrival in Canada. When you arrive, a border services officer will ask to see your passport and other documents – for example, a U.S. Green Card. Children under 18 must travel with appropriate documents and meet the same entry requirements as adults. Contact us for more information about requirements for minor children. Once your eTA is approved, check that the passport number included in your eTA approval email matches the number in your passport. If they don’t match, you need to apply for a new eTA. Super rush processing times for Canada ETAs are approximately 15 minutes. 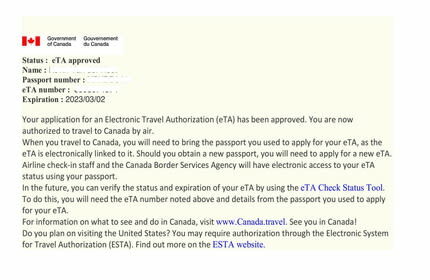 What is a Canada ETA (Electronic Travel Authorization)? An ETA is a new entry requirement for visa-exempt nationals who will arrive in Canada by air. From March 15, 2016, visa-exempt country nationals who fly/transit Canada will need the ETA. Exceptions include US citizens and travelers with a valid visa issued by the Canadian Embassy. What do I need to apply for a Canada ETA? The cost for a Canada ETA is 5.50 USD. Additionally, there is a service fee of 14 USD for standard processing. For rush processing and super rush processing the service fee is 44 USD and 64 USD, respectively. Yes. All travelers, regardless of their age, will need the ETA when they travel to Canada. Even if your child is on the parent's passport, a separate application must still be completed for the child. Citizens and nationals of the following countries are eligible to apply for an ETA: Andorra, Antigua and Barbuda, Australia, Austria, Bahamas, Barbados, Belgium, Brunei, British citizens, British citizens of overseas territories, Korea, Finland, France, Germany, Greece, Hungary, Ireland, Iceland, Solomon Islands, Italy, Japan, Latvia, Liechtenstein, Lithuania, Luxembourg, Malta, Mexico, Cyprus, Monaco, Norway, New Zealand, Netherlands, Papua New Guinea, Poland, Portugal, Czech Republic, Permanent Residents of USA, Samoa, San Marino, Singapore, Sweden and Switzerland. No, the Canadian ETA is valid for 5 years or until your passport expires. You can visit Canada as many times as you wish as long as the ETA is valid. Note that each visit is limited to a maximum stay of 180 days. If you want to know if Canadians are as nice as everyone says, then you must take a trip there and convince yourself of that fact. Canada is a huge country, but it has only about 36 million people. Even so, a trip there is worth your while for the wilderness alone. You can visit lots of places, including cities that will remain in your memory forever. Nevertheless, there are still a few things that you should know so that you can be prepared. One of the first things you need to check off your list is the documentation. Chances are that you are going to need some sort of a travel document to enter Canada. There are some visa-exempt nationalities, but even they require an Electronic Travel Authorization, also known as an ETA, to cross the border. The only exception is represented by US nationals. If you do not belong to any of those categories, you need to go to the nearest Canadian embassy to get a consular visa. The requirements are easy to meet, but we recommend that you go through this process in advance to avoid delays and whatnot. Before thinking of making a tour of Canada, you should be aware of the fact that the distance between destinations is usually enormous. Canada has vast territories. The point of this is to know that you will not be able to see everything you want to see in a single short trip. You will need some time, especially if the destinations you want to visit are scattered all across Canada. Even so, you have multiple means of transportation at hand, and if you want to enjoy the scenery, taking the train may be your best option. No matter how much you read about Canada, nothing can prepare you for the weather. Of course, it depends on your country of origin and its climate, but Canada can be incredibly cold. It matters what seasons you choose to visit the country, but even in the summer, the temperatures can drop dramatically in the prairies and in the mountains. What you need to remember here is to pack layers. Lots and lots of layers. Plus, you need a thick woolen hat, gloves, and a warm scarf. Your extremities can get very cold, and you do not want anything falling off, do you? Insulated clothing is something you should consider if you hate the idea of multiple layers. It may be more expensive, but it is worth it. You will be warm and comfy for the entire trip. One other thing you should consider in Canada is Couchsurfing. Have you ever heard of it? People in Canada are actually as friendly as most of the world thinks. That is why you can stay in someone’s spare bedroom or on their couch for free when you visit Canada. Even hostels are quite expensive in Canada, and if you do not want to spend most of your money on accommodation, Couchsurfing is your best option. There are several websites where you can arrange that. One big plus of Couchsurfing is that not only you have a free place to sleep, but the host will know the best places to visit in a particular city. You can get a warm bed, a nice meal, and some valuable tips for your trip. It cannot get any better than that. Another ‘rumor’ about Canada is that you can find a Tim Hortons around every corner. Except that this is not a rumor, but a fact. You do see a Tim Hortons everywhere you go. .It is a Canadian icon for chains of coffee and donut shops. It is just as common as nice people and maple syrup. You all must have heard about Canada being medical heaven. The insurances cover everything, and people rarely take money out of their pockets to pay for medical care. While that is true, the principle does not apply to foreigners. That is why if you plan on visiting Canada, we advise you to buy travel insurance if your current policy does not cover international medical care. At the same time, make sure that your policy covers everything you want to do while in Canada. A regular insurance policy will not cover rafting or skiing, so if you plan to do those things, get insurance that covers accidents that may occur while rafting or skiing. Otherwise, you will be required to pay huge amounts of money for the medical services you receive. To experience the best of Canada, do not stay inside the city borders only. As mentioned earlier, Canada is a vast country, and there are just 36 million people. It is about the same size as the whole of Europe. That means there is a lot of wilderness in Canada. But my god, what a wilderness. The mountains, the prairies, and the lakes are stunning, and you can engage in all kinds of activities. You can go rafting, skiing, trekking, canoeing, camping, fishing, and whatever else you can think of. If you are a photographer, Canada’s wilderness is paradise. The scenery is breathtaking, and surely you will never forget what you see. Most of the places are untouched, and you can absorb nature in its purest form. Just make sure to keep away from the wildlife, and if you encounter a moose, do not anger it. Nobody has ever won a fight with an angry moose whose territory has been accessed. The bottom line is that Canada is almost everything you can hope for. You have the lovely people who apologize for everything, the delicious maple syrup, and of course, Tim Hortons. But that is not all. Canada is full of places where you can get lost in. In the metaphorical sense of the word ‘lost.’ You will create unforgettable memories, experience all kinds of exciting and fun activities, and with some luck, you can find accommodation for free. It is a dream destination. Everyone who has ever gone there agrees with that, so why should you not have the best time there?